It is with great sadness we announce the sudden passing of our beloved father, grandfather, brother and friend, Dennis Harold Pawlyshyn, on Wednesday, September 12, 2018, at the age of 71. Dennis was predeceased by his parents Harry and Sophie Pawlyshyn. Left to cherish his memory are his children, Darcie (Darren), Neal (Melissa) and Amber (Matthew); grandchildren, Eric, Mason, Colton, McKenzie, Lukas and Kaitlyn; brother Kenny (Velma); sister Donna (Fred) Shandroski; numerous nieces, nephews and very close and special friends, Edie, Maurice, Wayne, Ed, Gary and the late Yogi Klos. Dad was born in Winnipeg and raised in Elma, MB. He was the eldest of three children. He went to school and worked at his parents’ business: Harry’s General Store. In 1967 he married mom, Sylvia Bencharski, and raised our family. Dad obtained his certificate for an Autobody Technician from RRCC in 1971 and worked at Melnick’s Garage. In 1977, Dennis’ Autobody was established. Dad worked long, hard hours every day doing the book work, labour and customer service all on his own. But dad believed in living life to the fullest and still found energy to enjoy baseball, curling, hunting and fishing with his buddies. 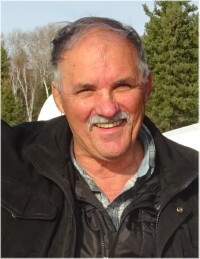 Dad retired from his business in 1993 and moved to Beausejour. He made many dear friends and spent his time golfing, gardening and cooking. Dad loved to dance and even became a dance instructor. Whatever caught dad’s interest he would commit and excel. He loved to laugh and play practical jokes. One of Dad’s greatest joys was spending time with his grandchildren; watching their sports, taking them for “tractor” rides, and hanging out with them. The family would like to acknowledge the Royal Canadian Legion Branches 141 and 215. Dad always talked about the great time he and his close friend Edie had dancing and taking in the sounds of his favourite bands, especially Glen Ambrose and his band Gemstars. Dad’s big heart, kindness and unique sense of humour will be greatly missed by all of us. We love you and we’ll miss you. A private viewing will take place for family and close friends. A Memorial Service will be held on Tuesday, September 18 at 9:30 a.m. at Sobering Funeral Chapel, 1035 Park Avenue E., Beausejour. Interment will follow in the Holy Cross Ukrainian Catholic Church Cemetery in Elma, MB. In lieu of flowers, donations may be made to the Holy Cross Catholic Church or to the Heart & Stroke Foundation. Will always treasure Dennis’s Friendship, especially on the Dance Floor. Our most sincere condolences to the family. Dennis was part of our family and will truly be missed by all. I enjoyed Dennis’s passion for fishing, canning and listening to Ukrainian music. Luckily, we had the chance to enjoy a beautiful day fishing on Sept 6. Walleye’s were biting, pickels were good and not to forget the ’83, and foot stomppin’accordion music in the evening. He will be so sincerely missed by the Bargenda family. Condolences to the Pawlyshyn family. I have lost a friend and a brother from another mother. Dennis and I were friends and cohorts in a lot of mischievous endeavors. Even thought Dennis was some nine years older we fit like a glove on many prank filled adventures. As time passed we found other people and events to pass our time and were not as close but he always remained in my heart as a friend and a buddy. We knew a lot of people and had extreme adventures if I had to state, people would think they were fiction. Dennis was likable and always had his hand out to help and advise and teach and I can state, I had learnt a lot from this individual some good some bad. But always remained a experience. Dennis I will miss you tears alone can not express my sorrow. I know god will have a place for you as no one can help but love your smile and your sense of wit only you could put forth. Till we meet again I will always think of you and the life experience with autos, friends and women we both met. And leaving too soon this earth with so much more you could have taught others. To you my friend I raise my last glass of Crown Royal. It’s not as cheap as 88 but Dennis your worth it. Deepest Condolences to the Pawlyshyn family.